So, did the life of Christ, “humanly speaking,” end in failure? And was the cross of Christ a failure? It was if you see the need for a continuing sacrifice, the sacrifice of the Mass. The unbiblical Mass offers a bloodless sacrifice through the ritual of Transubstantiation, which basically means, that the bread and the wine used in the sacrament of the Lord’s Supper is actually transformed by the priest into the actual flesh and blood of Christ, although the bread and wine do not change appearance. The Catholic Church interprets this literally, hence the doctrine of Transubstantiation. However, Jesus followed up the previous verses with verse 63, which says, It is the spirit that quickeneth; the flesh profiteth nothing: the words that I speak unto you, they are spirit, and they are life. Jesus stated that His words are “spirit.” He was using the example of eating and drinking to teach a spiritual truth. Just as consuming food and drink sustains our physical bodies, likewise, we are saved and sustained by spiritually receiving Him, by the grace of God alone, through faith alone. The example of eating the flesh of Jesus and drinking His blood is completely symbolic of fully and completely receiving Christ in our lives by faith. Evidently Pope Francis, following Catholic dogma, believes the life of Christ ended in failure at the cross because His death and resurrection alone was not enough to provide salvation. Therefore, to the Catholic, in order to “receive Christ,” they have to partake of the unbloody sacrifice of the Mass. In other words, Jesus must be re-sacrificed again and again. That being the case, then for Rome, the work of Christ on the cross of Calvary was a failure. Hebrews 10:10: By the which will we are sanctified through the offering of the body of Jesus Christ once for all. 1 Peter 3:18: For Christ also hath once suffered for sins, the just for the unjust, that he might bring us to God, being put to death in the flesh, but quickened by the Spirit. Hebrews 9:27: So Christ was once offered to bear the sins of many; and unto them that look for him shall he appear the second time without sin unto salvation. Hebrews 7:26-27: For such an high priest became us, who is holy, harmless, undefiled, separate from sinners, and made higher than the heavens; Who needeth not daily, as those high priests, to offer up sacrifice, first for his own sins, and then for the people’s: for this he did once, when he offered up himself. The last verse blows the unbiblical doctrine of Transubstantiation out of the water. We do not need a priest to offer up another sacrifice, daily, weekly, or anytime, because Jesus offered Himself FOR SINS ONCE FOR ALL. So, “humanly speaking,” was the life of Jesus and His death on the cross a big failure? To borrow a word from Paul, GOD FORBID. The life of Jesus was holy, and without sin. 1 John 3:5: And ye know that he was manifested to take away our sins; and in him is no sin. 1 Peter 2:22: Who did no sin, neither was guile found in his mouth. 1 Peter 1:19: But with the precious blood of Christ, as of a lamb without blemish and without spot. When Jesus died on the cross, God the Father was pleased. It was only through the death of Christ that salvation is obtained for mankind. Here is a true biblical prophecy of the death of Jesus, crucified for sins, and raised from the dead over 700 years before it happened. When Jesus was “bruised” it refers to His death by crucifixion, and the fact the He was a sin offering. The prolonging of His days is a reference to His resurrection from death and eternal life. And when it says he will see his seed, it means that untold millions of people will be saved from the second death through His “once for all” death; they are the “seed” or offspring as a result of His death on the cross. Was the cross a failure? No, it is the only means of salvation. Paul called it the power of God. The gospel of Christ is the power of God which leads to salvation to those who choose to believe. His death, burial, and glorious resurrection, is the power of God–think of that! That is why Paul also said that those who are the enemies of the cross deny the “power of God.” They have to, in order to sustain unbiblical doctrines such as salvation through the false doctrines such as Transubstantiation. Philippians 3: 18: For many walk, of whom I have told you often, and now tell you even weeping, that they are the enemies of the cross of Christ. Paul also said that one of the major sins of mankind during the final days of planet Earth will be those who pretend to a form or style of godliness, yet deny through their unbiblical doctrines, the power of God (which is the pure gospel of Christ). So Pope Francis is wrong, totally and completely wrong! The infallible Pope of Rome claims that “humanly speaking” the sinless life, and selfless sacrifice of Christ, was a failure. That reminds me of something Kenneth Copeland once taught–that the biggest failure in the Bible was God! 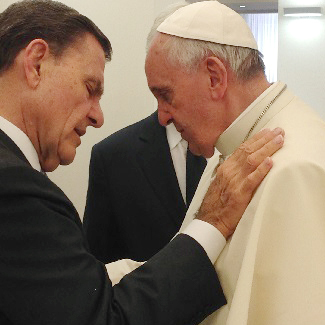 Birds of a feather do flock together, considering that Reverend Copeland and the Pope had a little meeting at the Vatican in June of 2014. Believe the Bible, not the unbiblical myths of men. They are Pharisees, and they will bind you up with burdens of doctrine, hard to bear. We have been warned. 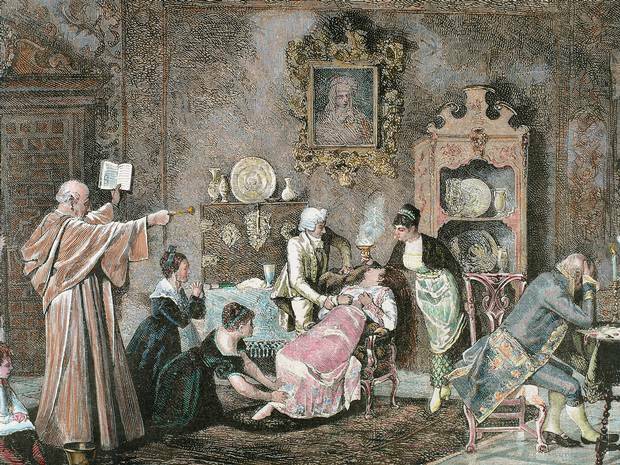 I have noticed there are quite a few articles in the news lately about the rites of exorcism and the training of new exorcists in the Catholic Church. Right now there is a conference going on at the Regina Apostolorum in Rome, Italy. The conference is called “Course on Exorcism And Prayers of Liberation.” It is a six-day conference, April 13-18, 2015, (I wonder if the number 6 is intentional? ); the purpose of the course is to help bishops prepare priests who are assigned to the ministry of exorcism. 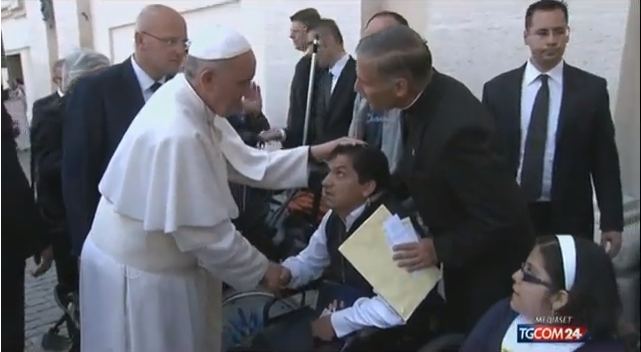 It was just a couple of years ago that Pope Francis may have performed an exorcism on a wheelchair bound man in St. Peters Square. In the video the pope can be seen laying hands on the man, and the young man suddenly begins to gasp. This response is what called attention to the possibility that Pope Francis may have performed an exorcism on the spot (although this was later denied by the Vatican). The story is dated May 22, 2013. Then another story appeared on May 31, 2013, Man in Pope Francis Exorcism Story Says He’s Still Possessed by Demons. The man, identified as Angel V, says that demons are still in him, although he is now able to walk. According to the article he has endured 30 exorcisms by 10 different exorcists, and he still is being tormented by evil spirits. It is interesting to note that when the Pope placed his hands on the mans head, the man let out a roar like a lion, according to witnesses. Then on January 8, 2014 an article appeared saying, Vatican and Pope Francis Seek New Demon Exorcists. According to the article there is a spike in the amount of people seeking relief from tormenting devils in the Catholic Church. Father Taraborelli works in the Rome diocese and claims that some weeks he performs up to 100 exorcisms. Then on July 3, 2014 the Vatican officially recognized the International Association of Exorcists, a group found in over 30 countries composed of 250 Catholic priests. Another article appeared in the Christian Post dated November 6, 2014 titled, Satanism Is on the Rise International Association of Exorcists Claims; Pope Blesses Them. In a related article in the Daily Mail dated November 4, 2014, it says that Exorcists report ‘an extraordinary increase in demonic activity’ as Pope praises their work. Evidently the Pope gave his blessing to the International Association of Exorcists. I could go on but I don’t want to bore you with redundancy. The link here is that at the same time all of this is going on, Vatican officials have been trying to convince everyone that aliens exist, and that when aliens finally reveal their presence to humanity they may need to be baptized into the Catholic Church. Even Pope Francis said he would baptize aliens if they were to show up. This is along with statements by the Vatican’s chief astronomer, Jesuit Brother Guy Consolmagno who stated that he also would baptize an alien if it asked him to do so. I find it fascinating that these two issues seem to keep showing up in the news, it is almost, shall I say, strange. Yet, it is not really strange that both issues keep showing up. There is a reason and both issues are linked together, allow me to explain. Now I realize that evil is increasing. Even a cursory read of the news will expose that to anyone who looks at the world through a Judeo-Christian worldview. We know from the Bible that at the end of days evil will increase, the Apostle Paul said that “evil men and seducers shall wax worse and worse, deceiving, and being deceived” (2 Timothy 3:13). The same Apostle also told us that we will live in “perilous times” (2 Timothy 3:1. Many of the articles I posted here about Catholic exorcism correctly state that evil is increasing in the world. The Internet, TV, and other things have spawned a lot of interest in the occult, witchcraft, and all things pertaining to the dark side. Why are people being attracted to this kind of material? Could it be that the dimensional boundaries are becoming thin, making it easier to contact the Fallen Ones? Are people using occult techniques they are learning from sources in the media, and as a result, is there an increase in demonic possession, not only in the Catholic Church but in other denominations, and even among the general public? While I disagree theologically with the Catholic Church on many things, I do think they are right to say that evil is increasing, and the Internet and other media are making it easier to obtain information about the occult. Then on the other hand, the Roman Church is raising up an army of official exorcists who have the blessing of the pope and other Vatican officials; and they claim that this army will fight the war against the evil forces of Satan as wickedness steadily increases in the world. UFOs and aliens are dangerous to human mental and physical wellbeing. What else should we expect from Fallen Angels; they are unpredictable, utterly depraved, and dangerous to toy with. The very same entities who claim to be aliens from Zeta Reticuli (or any other place in the universe), are the very same disembodied entities who pretend to be a dead husband in order to fool a grieving wife during a séance. (There are many hucksters in spiritualists churches, and also with mediums who operate séances, but there is a reality to it as well). These are the same fallen beings who are in contact with some New Age channelers (familiar spirits); and the very same disembodied beings also pretend to be Aliens, or Ascended Masters, or Space Brothers, or, to quote Jesuit Brother Guy Consolmagno, a “brother extraterrestrial.” Don’t be fooled by this deception–it’s only going to get worse as we move forward into prophetic time. The same fallen beings who ensnare people in occultism and other activities such as witchcraft, psychics who claim to have the power to contact the dead (can I include praying to dead saints here? ), and other New Age practices; these are the very same beings who appear as aliens and UFOs. That is why I see the connection between the Vatican raising up an army of exorcist priests and their incessant desire to convince 1.2 billion Catholics, and others, that there is no conflict between Catholicism and a belief in aliens, when they show up, or, when they are discovered by Vatican astronomers. The Pope and his legion of bishops and priests are causing billions of people to be deceived by Fallen beings who play both sides of the fence. It’s all a deep spiritual deception. The Pope and other Catholic leaders are spiritually deceived. Evidently, they see no problem with aliens as they are also training hundreds of priests to cast out the very same devils when the faithful find themselves tormented by evil spirits! ITS THE SAME BEINGS YOU ARE PLAYING WITH POPE FRANCIS. THE ALIENS ARE THE DEVILS. THEY ARE THE FALLEN ONES, AND WHEN THEY COME BACK TO EARTH THEY WILL PRETEND TO BE ALIENS. THESE ARE YOUR ALIEN BROTHERS FROM OUTER SPACE! Revelation 9:20: And the rest of the men which were not killed by these plagues yet repented not of the works of their hands, that they should not worship devils…. If you would like to learn more about the alien deception consider getting a copy of my book, Alien Antichrist, The Terrifying Truth about UFOs and Aliens, Antichrist, and the End of Days. I lay out in great detail how UFOs and aliens will be used by Satan to lead the world into the arms of the Antichrist. The deception is already here it will only grow stronger as time moves forward. Also, for a limited time if you have Kindle Unlimited or Kindle Prime you may download a copy of my book for free! Go there and hit the “Like” button–I would love to hit 100 likes on the page! Also, on the Alien Antichrist Facebook page I place links to news articles that pertain to the alien issue, space issues, or the persecuted church.